Blowout Sale! 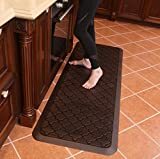 Up to 57% off on Comfort Mats at Turuya 7, Page 11. Top brands include Amcomfy, Royal, CubeFit, Butterfly, Urvigor, New Star Foodservice, & Ergodriven. Hurry! Limited time offers. Offers valid only while supplies last.